Corps de Bienville celebrated its 2nd annual Masquerade Ball Saturday, Jan. 24, at England Airpark Community Center. Reigning over the gala were Queen Corps de Bienville II, Denise Dobard and King Corps de Bienville II, Rick Tompkins. The evening begins with Mistress of Ceremonies, Zina Ford, presenting history of Krewe and introducing court. In the 1690’s, LaSalle claimed the territory of Louisiana for the French. The King of France awarded a proprietorship to the Company of the West, owned by John Law, to develop a colony in the new territory. Law appointed Jean Baptiste Le Moyne, Sieur de Bienville, Commandant and Director General of the new Colony. Bienville’s dream was to have a colony on the Mississippi River, which served as the main highway for trade with the new world. The Native American Choctaw Nation showed Bienville a way to avoid the treacherous waters at the mouth of the Mississippi River by entering Lake Ponchartrain from the Gulf of Mexico and traveling on Bayou St. John to the site where New Orleans now stands. In 1718, Bienville’s dream of a city became a reality. City streets were laid out: many of the streets are named for the royal houses of France and Catholic saints. Contrary to popular belief, Bourbon Street is named not after the alcoholic beverage, but rather after the Royal House of Bourbon, the family then occupying the throne of France. Very much like Bienville, in 2013, a group of revelers dreamed of building a Mardi Gras Krewe like no other in Central Louisiana, one that would be fun, festive and full of revelry. That dream also became a reality. 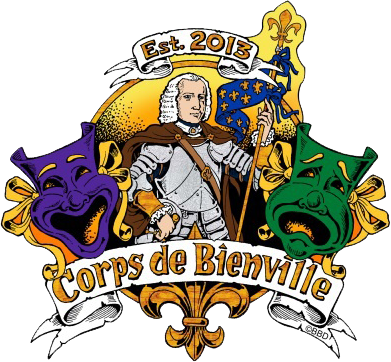 Thus Corps de Bienville was born. The Corps is open to male and female members over the age of 25. Captain Pat Leaumont led Krewe members in second line. Their entrance signaled the presentation of the 2015 court. Lady-in-waiting, Celeste Mobley, danced into the ballroom to tune of “Devil with the Blue Dress”. Knight, Charles Elliott, danced to “How You like Me Now”. Lady-in-Waiting, Kristy Skrobarcek, danced to “Boogie Shoes”. Knight, John Skrobarcek, danced to “Play that Funky Music”. Queen, Denise Dobard, and King, Rick Tompkins, dance to “Happy”. Founders of the Krewe, Greg Bennett, Colleen Dunstane, William Ford, Zina Ford, Pat Leaumont, and Rick Tompkins, attended the Ball. Officers for 2014-15 are Pat Leaumont, Zina Ford, Colleen Dunstane, Joy Williford, Molly Leaumont, Rick Tompkins, Mark Hromadka, Lacy Morales and Samantha Young. Guests were entertained by band, Magnolia, from Baton Rouge; Ball decorations were designed by Denise Dobard.